Precautionary light alarm system. Extraterrestrial civilizations by different methods warn mankind that Earth will not always be a reliable house, because global cataclysms will begin. However, the main method is precautionary light alarm system that extraterrestrial civilizations have established in many built by them complexes. Among them ―the great Stonehenge and Kukulkan pyramid in Chichen Itza, New Grange, Chavin de Huantar, Loughcrew, Maeshowe, Dowth, Knowth and others. With the help of different effects of sunbeam extraterrestrials inform about the dates deadly dangerous for mankind. There are four dates during a year - vernal and autumnal equinoxes, as well as summer and winter solstice. This way are marked the dates of three preliminary cataclysms that will occur on the Earth within one year before the beginning of global. The strength of beginning cataclysms will be incommensurable with the life of a human and organic nature. Therefore dreams of earthlings about continuation of life may turn out unrealistic. The Transition by the Instructions. ETC offer to humanity an incredible way to save lives - to make the Transition from the level of the Crystal Structures, where we live today, and where soon will be raging cataclysms, on the secure Highest level of the material world, i.e. to the kingdom of heaven. In the basis of the Transition lays an unknown to humanity the Law of the action of the united consciousness. It consists in the fact that the unified consciousness of humanity has to trigger an action in the form of a laser beam, which will destroy our bodies at the level of the Crystal Structures. At the same moment will happen the general resurrection on the Highest level of the material world in a new cycle of life. Extraterrestrials disclose a technique of the Transition in the detailed Instructions. The Instructions for the Transition of extraterrestrial civilizations are presented by unknown to mankind symbolism of consciousness in stone complexes, which stood millennia, and scattered all over the planet. For reading this symbolism, shortly before the beginning of global cataclysms, to the Russian scientists, the authors of this article, were given from the Above the two keys. So, from the Above was made the replacement of Keys of the Kingdom of Heaven – two real, which were given to the apostle Peter, on two keys to the symbols of consciousness, by which are presented the Instructions for the Transition. Extraterrestrials are warning that global cataclysms will begin soon after humanity will begin to read the symbolism of consciousness and will understand the Instructions for the Transition. Thus, our life will not prolong by itself – we have to fight for it in accordance with the Instructions of extraterrestrial civilizations. They inform that the Transition can be made only by the whole civilization simultaneously. Nobody will be saved by alone. Moreover, extraterrestrials warn that the Transition is necessary to make before the second pre-cataclysm, because the number of people remaining after it will be not sufficient to start up the mechanism of the Transition. So, in order to make the Transition in time, humanity has to know the dates of the preliminary cataclysms. Thus, light signals, by which are denoted pre-cataclysms, are strictly regulated by the importance of events. The dates of the first and the second - the major pre-cataclysms, which determine the life of humanity, are marked by the grand shadow effect of the descending serpent, which occurs twice a year on the Kukulcan pyramid in the Mexican complex Chichen Itza. The first preliminary cataclysm will occur on the day of the autumnal equinox on September, 22. The second pre-cataclysm will occur on the day of the vernal equinox on March, 20. This phenomenal show each time is striking the imagination of thousands of people that gathered from all over the world, giving rise to numerous questions. Extraterrestrials inform that the epicenters of the first and second pre-cataclysms will be in the Mexican Gulf. Edgar Cayce predicted that during the severe natural blow in a few minutes waters of Mexican Gulf will be joined with Great Lakes. Cities of the west coast – San Francisco and Los Angeles – will be destroyed before the cities of the east coast. According to Edgar Cayce, will not be affected only area of Chicago and the surrounding territories. The safety of these places will be caused by the location of the very strong Temagami Magnetic Anomaly. December 21, 2012 ― the end of the cycle of Consciousness. By light signals are designated two more dates in the year - winter and summer solstice. December 21, 2012– winter solstice – is the world known as the end of the Mayan calendar. However, more importantly, that this is the date of the end of the cycle of Consciousness of humanity on Earth, which opens the beginning of global cataclysms. The date of the third pre-cataclysm – is the day of summer solstice, June, 21. This date is the only one, remaining uncertain of the four dates, marked by light signals. Three other light signals were completely determined – the dates of the first and the second pre-cataclysms, in the days of autumnal and vernal equinoxes, and also the date of the end of Mayan calendar – December 21, in the day of winter solstice. It should be noted that the date of the third pre-cataclysm does not matter to mankind, since knowledge of this date no longer be able to help humanity, doomed to destruction. Remaining on the planet after the second pre-cataclysm small number of people about 1 billion, soon will be destroyed by increasing global cataclysms, which will continue until the complete destruction of the planet. The third cataclysm, most likely, will be developed by the model of the Russian scientist Nikolai Zharvin that reveals its planetary enormity. According to the model, the cataclysm will be caused by underground chain reaction in the Earth' global rift system - a tape of underwater volcanoes that surrounds our planet across continents and oceans and is about 80,000 km long. In the result volcanoes will begin to explode throughout its length. «Will arise giant waves of super-tsunami up to 10 km high, which will go on thousands of kilometers through all seas and oceans, destroying everything in its path. Giant super-tsunami will go over the British Isles and in the Baltic basin will wash away Norway, Sweden, Finland. The second edge will go in the direction of America. Leaping over low Appalachians, will flood the valley of the Mississippi River. They will affect the entire Russia – from edge to edge. The United Kingdom, most of North America and Western Europe will be destroyed. This catastrophe is inevitable», – predicts N. Zharvin. It has to be noted, that on this pre-cataclysm in the date of summer solstice, which opens the period of the zodiac Cancer – June 21 to July 21 – also pays attention the picture 70 «The Red Cancer» from the so-called «Lost book of Nostradamus». The picture warns about a large number of human losses and informs that the natural blow will be associated with temperature processes. It also informs that the only way out is to unite consciousness of civilization and the Transition. The blow, destroying Rome will destroy Vatican City. St. Malachy predicted that doomsday event will begin by a strong blow that would destroy Rome. In fact, the purpose of this blow is not destroy Rome, but destroy Vatican City, as an area of Rome. This blow must show the people of the world that the keys of the kingdom of heaven, which was the basis for the papacy for two millennia, already do not work. This means that the tasks that were put for the papacy, already has been fulfilled. These old keys already can not open the gates of Heaven in order to save people there, despite the fact that just today arise the need for the salvation of mankind from global cataclysms. The goal of the destruction of Rome is to show, that the two keys of the kingdom of heaven that were given to the Apostle Peter, had been replaced from the Above by the new symbolic keys to read the Instructions for the Transition, written by symbols of consciousness. Consequently, the blow destroying Rome, has to occur suddenly. However, this blow may occur at any time, but only prior to the first pre-cataclysm or immediately thereafter. i.e. only between the dates of the second and first pre-cataclysms. It is important to note that in Italy there are no operating nuclear power plants, so radiation on the planet after the destruction of Rome will not arise. It will arise only after the first pre-cataclysm. Thus, the date of 21 December 2012 opens the beginning of global cataclysms after the end of the cycle of Consciousness. The blow that will destroy Rome, will mark the beginning of the events of the End of the World because immediately after it, preliminary and global cataclysms will begin. The dates and the year of the beginning of pre-cataclysms. It is important to note that from the Above we have been given only the dates and the sequence of the three pre-cataclysms during the year. We were not informed from the Above about the year of the beginning of these events. This information will be given to us directly before the start of the events. The year of the beginning of pre-cataclysms is designated in the prophecies of Edgar Cayce, Nostradamus, and other predictors. Edgar Cayce about the last the 44-th US President. The year of occurrence of cataclysms can be identified by the predictions of Edgar Cayce, who informed that the 44-th US President, will be the last, and the only way to salvation - the hope of the world - will come from Russia. Today the current 44-th US President is Barack Obama. Therefore, Edgar Cayce warning is for our time. About beginning of strong cataclysms in our days predicted also many other great prophets and predictors. Among them, Nostradamus, Yitzhak Kaduri, Vanga. The Bible informs that the events of the End of the World will start suddenly when «peace and security» will be declared as the main topics on the planet (First Epistle to the Thessalonians, Chapter 5; 1, 2, 3). This period started from the terrorist attack in New York on September 9, 2001. Today, a passionate call for «peace and security» sounds everywhere and combines the efforts of all countries of the world to combat terrorism. «Sky tsunami». About close beginning of global cataclysms extraterrestrials warn mankind by the many methods. For this goal, shortly before the beginning of global cataclysms, they began to transmit emergency messages, as lightning telegrams. One of the methods for transmitting emergency information was crop circles. All necessary information has been successfully transferred. Today – it is a massive hoax made by people. It is possible that «sky tsunami», which in the past few years have seen people around the world, is also an urgent warning about the imminent beginning of global cataclysms. To this thought leads the common theme, which reveal these strange pictures created by the clouds – they all show ocean tsunami of incredible height, unprecedented for humanity. Sometimes «sky tsunami» presented a huge wave of unprecedented height, engulfing the city. In 2015 such amazing painting, created by clouds, observed thousands of people in Sydney, Australia. The city was covered by coming out of the ocean a giant cloud, resembling a tsunami. «Sky tsunami» initially moved along the coastline, partly gripping the area of the city, and, then headed to the center of Sydney, as if overwhelm the city. In other places, clouds created numerous fiery crests of standing waves of tsunami, going, one after another. Located high above the tops of the mountains, they showed, thus, their great height. Sometimes in the sky arose huge fiery pictures of numerous crests of waves, continuously going one after another, above the surface of incredible mass of water, depicting the ocean depths. Their aggressive bend resembled knives of a grinder, and fiery color not only borders, but also of the basics of the emerged picture, emphasized the incredible power of waves, capable to destroy whole continents. «Sky tsunami» appeared over Australia and the Mexican Gulf, in the sky of the US and China, Switzerland, Africa and other countries. 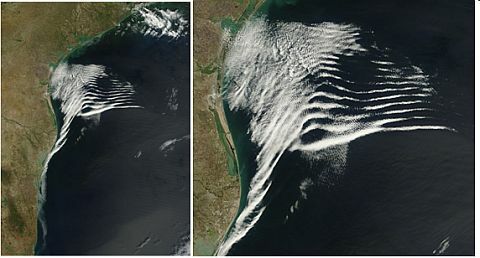 Wavy clouds, that created «sky tsunami», were registered also by NASA satellites. Sometimes lacerated foam crests of powerful tsunami were depicted by the white clouds, located throughout the length of the wall of the dust storm. The created image was so realistic that even local residents at first, took the highest wall of dust with crests-clouds on the top, for the tsunami. It is interesting, the photographer, that shoot the film from the helicopter, off the coast of Florida in Panama City, and describing one of the cloud waves, noted that the thin clouds hang over the coastline as the water at tsunami. Moreover, a great height of «cloud waves» was significantly higher, than high-rise buildings standing on the banks, covering them. In the sky of China also in 2015 appeared a mirage of a modern city of skyscrapers, plunging into the depths of waters. The artistic representation of these events of the nearest future – flooding of cities and change the landscape of the planet –- is represented in the picture E. Popova «Fishes in the City». Besides «sky tsunami», in the sky appears also other phenomenon, depicting the flooding of populated areas. 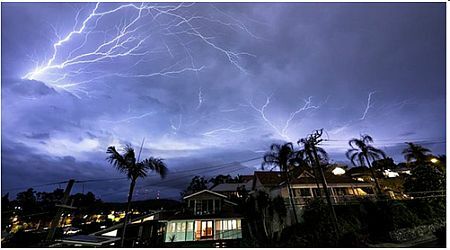 For example, in Australia during an unusual storm, numerous lightnings flowed through the sky as on the water. What is it? The natural phenomena or warning of extraterrestrial civilizations about the imminent approach of global cataclysms of the planet destruction? If this is the really warning of extraterrestrial civilizations, each of these menacing pictures observable from large territories, clearly demonstrates to humanity incredible strength of super-power natural blows and impossibility to survive in such conditions. Extraterrestrials warn that peace, mutual understanding and love necessary for the Transition - are the main criteria for the continuation of life of civilization. And each of us has to deeply focus on these feelings, because for the Transition is given a very short period of time - between the first and second pre-cataclysms. After it mankind will already doomed. «The Hand of God» and «the Angel wings.» At the beginning of 2016 in the sky of England, Scotland and Portugal appeared the images paintings from the clouds, which the media immediately called «the Hand of God» and «the Angel wings». Many thousands of people were impressed by these pictures. The painting «the Hand of God», presented by a fiery-red cloud, appeared on January 25 in the sky over the Portuguese island of Madeira. Another picture from clouds «the Hand» appeared in the sky above the village Kinlochewe in the northwest of Scotland in early February. The pictures in the sky reminds a hand, which is trying to reach the earth. This image, as if disseminates information about the possibility of salvation through the Transition from the level of Crystal Structures, where today lives mankind, to the Kingdom of Heaven on the secure Highest level of the material world. This is especially important for people living in the territories, from which can be seen these pictures, because at the first blow of cataclysms, they will either be destroyed or their landscape will be much changed. Edgar Cayce predicted that after the strongest natural blow, which obviously, will be the first pre-cataclysm, in the blink of an eye will be changed the upper part of Europe, and most part of the UK and Japan will go under water. Perhaps, as the presentation of the only way of salvation of mankind from global catastrophes through the Transition, in the sky over the British county of Cornwall on March 18, 2016 appeared amazing clouds in the shape of angel wings on the background of the rising sun. The picture was formed by two clouds in the form of two crescents arranged vertically - symbols of the united consciousness. The upper horns of crescents were directed to different sides, and at the bottom between their horns was placed a glittering circle of the rising sun. The sun depicts the laser beam, kindled by the united consciousness of humanity with a common goal – the Transition to the Highest level of the material world. Udumbara flower. Currently, people of Earth mark the appearance of the so-called heaven flower Udumbara, which blooms once every 3,000 years. A rare flower Udumbara has a stem thinner, than a human hair and aroma of sandalwood. It is believed, that its bloom means the appearance of the new spiritual leader due to radical changes in the life of mankind. Obviously, this bloom is due to the Transition of humanity to the next cycle of development of consciousness. This is the only way for the continuation of life in the beginning of global cataclysms on the planet. The received information about the dates of pre-cataclysms gives humanity a complete opportunity of victory of the Transition and continuation of life through the General resurrection.